Rich wants you to believe that you’ll just be able to sign up & begin making money right away hence the system’s name, but is it really legit & can you really make money with it or is the Instant Cash Solution system a scam that’ll just end up conning you instead? What Exactly Is The Instant Cash Solution System? As the name suggests the Instant Cash System is a system which claims it can help you achieve exactly that – instant cash – and on top of just achieving instant cash it also claims that you can do it with little to no work whatsoever. But I think you’ll agree with me here when I say that just sounds WAY too good to be true… And you know what they say about stuff that sounds too good to be true? It usually is! You see whilst the internet is great & whilst it does indeed certainly provide people with a lot of extra ways to make money – it’s not magical & none of the methods will see you earning lots of money quickly or easily. So whenever I see a system promising that you can make money quick & easy I straight away assume that it’s just going to be a get-rich-quick scam because it’s just hands down not possible (and I say that from many years of experience). The good news though is that if you are prepared to put in the real work required to build a genuine income online then there are indeed legitimate places out there where you can get started for free such as Wealthy Affiliate. How Does The Instant Cash Solution System Work? You see the whole thing is simply about buying into it, upgrading to the highest level possible & then promoting it online (via the so-called “copy and paste” ads) to sucker others into doing the same. There’s no real products or retail sales here, all that’s being made is direct member to member payments & that’s 100% bad news. I mean they don’t even make any real attempt to hide it well either – and that’s easily seen when you visit the system’s website. There’s literally no mention of products whatsoever – the sole focus is entirely on the money making opportunity. But you’re also told that if you join any of the levels less than Platinum you’ll lose out on commissions if you happen to refer somebody who upgrades to a higher level than the one you’re at, so ultimately you’re heavily pressured into purchasing Platinum for $500. Then once you’ve purchased a level (which I definitely don’t recommend doing) you’re told to promote the system to others & get them to sign up to the highest level you possibly can as this is how you’ll be making money. Just like you they won’t be getting anything in return for their money other than the opportunity to refer other people, however you’ll be pocketing a commission at their expense if they buy in at a level. However like I said above there’s a bit of a catch. Let’s say you just bought in at Bronze to try it out & you referred somebody who signed up to Platinum for $500… You should earn $500, but you won’t – instead you’ll only earn $100 (for the Bronze level) and the $400 will be passed up to the next person that owns a Platinum subscription above you. It’s just a trick to get you and the others to invest as much as possible. Sadly though most people who join these types of pyramid schemes never make any money because it’s MUCH harder to get people to sign up to them than the creators/people promoting them make out. That’s why they’re illegal – and another reason they’re illegal is because ultimately they’ll end up collapsing once the pyramid gets too “bottom heavy”. So whilst it might sound like an easy way to make cash in theory, in reality it’s actually far from it. Unfortunately though that ain’t gonna work! I mean sure you could copy & paste ads all day long, but they’re the exact same ads that all of the other members of the system are posting so nobody is going to be interested in them & furthermore nobody who clicks the ads is going to be interested in signing up to a pyramid scheme. You’d have to get literally thousands of people to click the ads to just sucker as much as 1 person into a scheme like this – and to be honest I really really hope that you’re not interested in “suckering” anybody in. 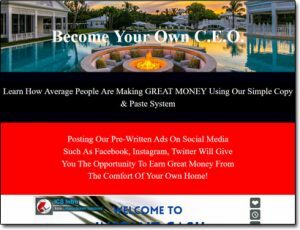 There are simply many other legitimate ways that you can make money online instead – there’s no need to involve yourself in BS like the Instant Cash Solution. My Verdict – Is Instant Cash Solution a Scam? Yes, there’s absolutely no doubt about it – the Instant Cash Solution is a pyramid scheme which governing bodies like the FTC explicitly state as being a scam, so I certainly wouldn’t recommend getting involved with it. The creators make it all seem easy but the truth is that the majority of the people who end up getting involved with such schemes actually end up spending more money on them than they ever manage to make back. I mean don’t get me wrong, the Instant Cash Solution does provide its members with some “training” in return for their money but it’s quite clear that the primary focus is on the “business opportunity” (which regardless of products makes it a pyramid scheme) and also the “training” that you are provided with has a primary focus on just re-promoting the Instant Cash Solution program to others. Like I mentioned earlier in this review there is simply no need to get involved with such a BS system when there are plenty of places that you can get started at for free such as Wealthy Affiliate (which is one of my top recommendations). And alongside that there are also a bunch of other great ways to make money online too. Gold Opinions Review – Is It a Scam or Can You Really Make Good Money With It? Secured Web Orders – Another Scam or Legit System? Full Review!